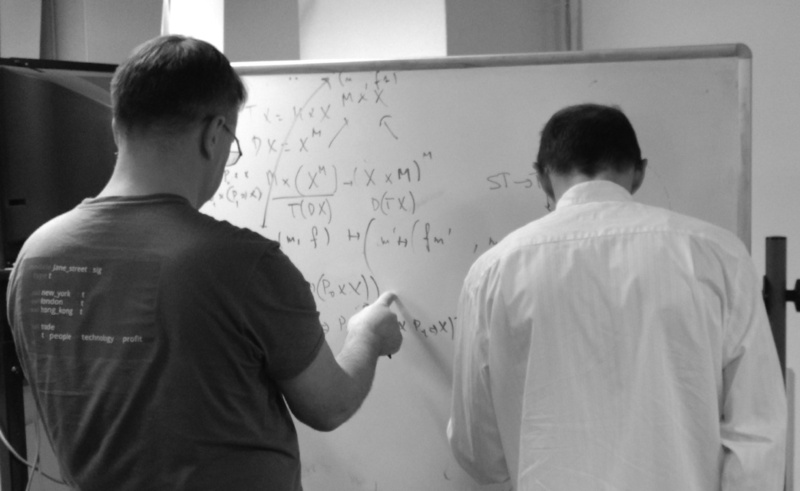 CLAP Scotland is a forum for applications of category theory and logic to physics and computer science, that aims to maintain and enhance the cohesion of Scottish research in these areas. The meetings provide an informal atmosphere where participants can easily interact. They are open, and all are welcome to attend, in particular research students. This is a continuation of the series of CLAP workshops in the greater London area held biannually 2008-2010, and of the Scottish Category Theory seminar that ran biannually 2009-2014, and we encourage the same friendly and open atmosphere. If you would like to host a meeting or give a talk, contact Chris Heunen. The spring 2018 meeting is subsumed by a larger workshop on Combining Viewpoints in Quantum Theory at the International Centre for Mathematical Sciences in Edinburgh. The fourth meeting will be held on 20 November 2017, in the School of Informatics at the University of Edinburgh, in room 4.31 in the morning, and room G.07 in the afternoon. 11:10 Danel Ahman (Inria Paris): Directed containers, what are they good for? Employing simple models from quantum mechanics we define families of 2D TQFTs where the fusion product is realised in terms of hopping algorithms of bosons and fermions on a circular lattice. We discuss their relation to known examples of 2D TQFTs before considering generalisations. There are combinatorial connections with the counting of dimer configurations and cylindric reverse plane partitions. Registration is free, but for catering purposes please email the local organiser Chris Heunen as soon as possible if you plan to attend. The third meeting was held on 5 April 2017, in the Department of Computer and Information Sciences at the University of Strathclyde, in room 1415 of Livingston Tower. There have been several projects reformulating some aspect of quantum theory in the language of category theory, for example: the monoidal approach to quantum theory, which encodes aspects of quantum theory as algebras internal to some symmetric monoidal category (e.g. Frobenius, Hopf, or H*-algebras); the topos approach of Butterfield, Isham and Doering, which embeds traditional quantum theory into a the framework of topos theory; and an approach to quantum logic of Heunen and Jacobs based on the semilattice structures associated with dagger-kernel categories. This talk intends to demonstrate that categorical diagrams are a simple and convenient way of visualising and reasoning about cryptographic protocols. We illustrate this with various examples of both popular and obscure protocols, to demonstrate how the flow of information among the participants may be modelled. We also provide evidence for the claim that there are deeper connections between category theory, complexity, and cryptography than simply modelling information flow. Topological fixpoint logics are logics that are interpreted over topological models and where the fixpoint operators are defined with respect to these topological interpretations. In my talk I will discuss a variant of these logics for relational structures based on Stone spaces, where the fixpoint operators are interpreted via clopen sets. I will present a game-theoretic semantics for this logic. The adequacy and bisimulation-invariance of this semantics will be the main technical results of my talk. Registration is free, but for catering purposes please email the local organiser Ross Duncan as soon as possible if you plan to attend. You might also be interested in the workshop on Algebra and Coalgebra meet Proof Theory held at the University of Strathclyde on April 10-12. The second meeting was held on 30 November 2016, in the Department of Computer and Information Sciences at the University of Strathclyde, in room 1415 of Livingston Tower. 10:30: Ulrich Kraehmer (University of Glasgow): What is a quantum symmetry? A dagger category is a category equipped with a dagger: a contravariant involutive identity-on-objects endofunctor. Such categories are used to model quantum computing and reversible computing, amongst others. The philosophy when working with dagger categories is that all structure in sight should cooperate with the dagger. This causes dagger category theory to differ in many ways from ordinary category theory. Standard theorems have dagger analogues once one figures out what "cooperation with the dagger" means for each concept, but often this is not just an application of formal 2-categorical machinery or a passage to (co)free dagger categories. We will discuss two instances. First, as soon as a monad on a dagger category satisfies the Frobenius law, everything works as it should. Dagger adjunctions give riseto such monads. Conversely, such monads factor as dagger adjunctions in two canonical ways; however, the Eilenberg-Moore category needs to be adapted t o inherit the dagger. Second, limits in dagger categories should be unique up to an unique unitary, that is, an isomorphism whose inverse is its dagger. We rework an initial attempt to a more elegant and general theory. It works well when the diagram has a dagger; however, the formulation of limits using adjunctions needs to be adapted. We will discuss work on defining dagger limits of general diagrams. We are accustomed to using strong monads to organize effectful computations in programming language semantics and monoidal comonads in a similar vein to organize coeffectful computations. I will show how a quantitative aspect can be added by grading, leading to mathematization of the old idea of effect systems from program analysis. I will first introduce graded (strong) monads, outlining both their theory and programming language applications, and will then discuss graded monads of monoids, graded distributive laws of a monad over a monad, graded (monoidal) comonads and distributive laws of a comonad over a monad. You might also be interested in the workshop on coalgebra, Horn clause logic programming and types held at the University of Edinburgh on November 28 and 29. The first meeting was held on 14 April 2016, in the School of Informatics at the University of Edinburgh, room G.07. Invariance is of paramount importance in programming languages and in physics. In programming languages, John Reynolds' theory of relational parametricity demonstrates that parametric polymorphic programs are invariant under change of data representation, a property that yields "free" theorems about programs just from their types. In physics, Emmy Noether showed that if the action of a physical system is invariant under change of coordinates, then the physical system has a conserved quantity: a quantity that remains constant for all time. Knowledge of conserved quantities can reveal deep properties of physical systems. For example, the conservation of energy is by Noether's theorem a consequence of a system's invariance under time-shifting. You might also be interested in two events earlier in the week: WadlerFest 2016 on Monday and Tuesday, and LFCS30 on Tuesday and Wednesday.